Modern citrus fruits, according to genetic analysis, are complex hybrids arising from mandarin, pummelo, citron and pepeda ancestors, refined by more than four thousand years of cultivation. Citrus sinensis, the sweet orange, has hundreds of cultivars. Growth rate: Slow to moderate, depending on rootstock. 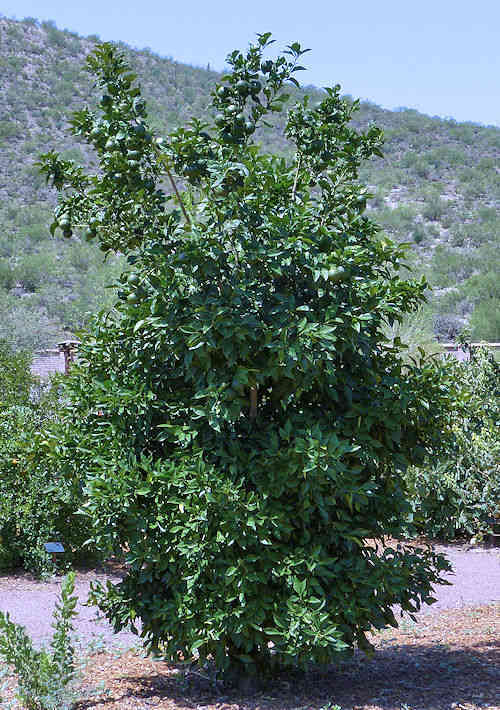 Mature Size: 30' high, depending on rootstock. Width varies with cultivar. 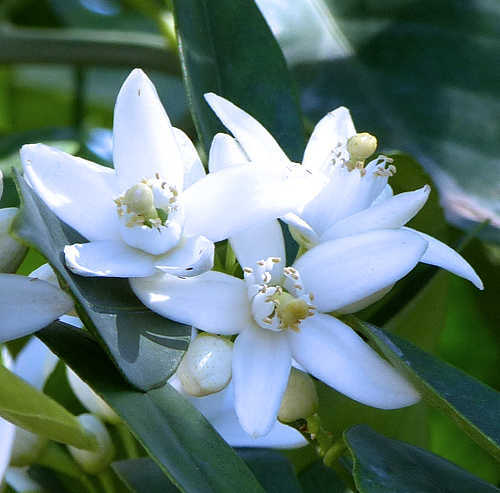 Flowers: White, five petals, fragrant. Bloom: Late winter into early spring. Self-fruitful: All sweet orange cultivars self-pollinate. Years before fruiting: 5-6 years after grafting, less on some rootstocks. Blood Orange cultivars often start fruiting 2 years later. Fruit: Round to oval, ripening to yellow or orange. The flesh is juicy and sweet, yellow, orange or red in color, and divided into 10-14 segments. The skin is tight and difficult to peel except on Naval oranges which have thick skin. Seedless cultivars are available. The sweetness of an orange depends on the total amount of sunlight received while on the tree, nothing else. Months for fruit to ripen: 9-12. The color of an orange is not a reliable indicator of ripeness. Remove one from the tree and taste it to determine if the fruit are ready for harvest. Fruit that have dropped from the tree within the last 24 hours are ripe and safe to use if they have no cuts and smell citrus-like and not moldy. 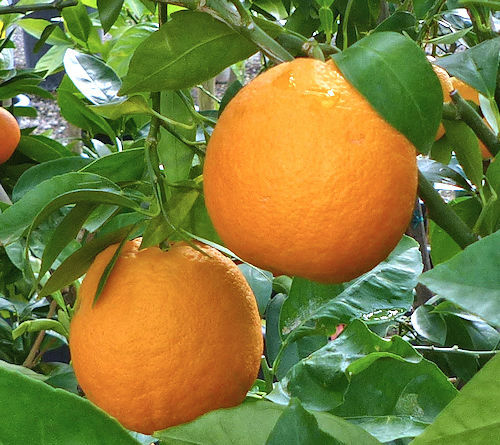 Most Naval Oranges ripen in winter or early spring. Valencia Oranges ripen in late spring and remain on the tree in summer. Oranges do not ripen further after harvest. Storage after harvest: Oranges can last 2-3 months in a refrigerator but must be well ventilated, not in a sealed container. Leaves: Green, smooth, thick, ovate to lance-shaped, providing heavy shade. Stems: A few spines may be present. The bark is prone to sunscald if not shaded by leaves, especially in higher temperatures. Roots: Orange trees are usually grafted onto a special rootstock that is adapted to the local climate. 'Blood Orange' An orange with dark red flesh, and a flavor that includes raspberry notes among the citrus. The color is most pronounced in cooler weather. 'Cara Cara' A red-fleshed naval orange, with an excellent, complex flavor. Extra sweet, low in acidity. 'Naval' An orange grown for fresh eating. 'Valencia' An orange with high vitamin C levels primarily used for juice. Toxic / Danger: Not to humans. The leaves are toxic to pets. Origin: Southeastern Asia, likely China. USDA hardiness zones: 9-11. Frost-tender. Best grown on a south- or east-facing slope above valley bottoms in zone 9a. Heat tolerant: Depends on cultivar. Water after becoming established: Deeply, monthly in winter to weekly in summer, from the trunk to just beyond the canopy. Young trees need watering more often than older trees even though older trees consume more water. A sign of insufficient water is the leaves turning dull and curling inward from the edges. Soil: Well drained, can be mixed with aged compost and sand, pH 5.6-8.5 (acidic to alkaline). Fertilize: Do not fertilize the first two years. Apply an organic fertilizer, every month, from mid-February to early October. Apply a citrus micronutrient solution three times a year in February, May and August. Do not fertilize after October to keep the plant from producing new growth that will be harmed by early frost. Mulch: Keep all mulches at least 1' away from the base of the trunk. Keep grasses and vegetation 3' away from the bud union on the trunk. Planting: Place the root ball so that it is slightly higher than the surrounding soil. Prune: Remove sprouts growing on the trunk under the bud union as they occur because they are from the wrong plant. Remove dead, damaged, crossing and weak branches in late winter. When shaping into a tree, unshaded trunks and branches should be painted with a tree trunk paint to protect against sunscald. Litter: Dropped fruit must be picked up immediately to avoid attracting wild animals. Propagation: Cuttings grafted onto disease resistant rootstock adapted to the local climate. Trees grown from seed are usually true to their parent tree characteristics.